Acadia’s brilliant, starry night sky used to be taken for granted. But growing awareness of its scenic and educational value has prompted a surge of interest in protecting this natural resource. Acadia is the only national park in the northeast that offers visitors the opportunity to enjoy a high-quality night sky and natural darkness, with stunning views of the Milky Way arching overhead—a sight that two-thirds of all Americans cannot see at home due to light pollution. The forecast for the growth in light pollution is alarming, yet there are easily identifiable solutions and a growing number of success stories in protecting and restoring night skies. Night sky friendly lighting typically saves energy, reduces glare, improves nighttime visibility, and improves safety. The goal to protect the night sky is not to turn off all lights and return to the dark ages, but to encourage the use of smart, well-designed outdoor lights. Among the many resource management challenges at Acadia National Park, light pollution is one of the easiest environmental problems to fix, and the natural dark sky is 100% recoverable. The solution is straightforward, instantaneous, and economical since it costs more to pollute the night sky than to protect it. 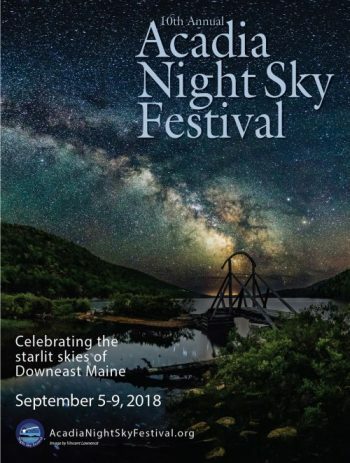 Since 2009, Friends of Acadia has assisted Acadia National Park and other area organizations to host the Acadia Night Sky Festival, a community celebration to promote the protection and enjoyment of Downeast Acadia’s stellar night sky as a valuable natural resource through education, science, and the arts. In 2011, Friends of Acadia helped the park to assess just how night sky friendly it is, with a grant for an internship to inventory the park’s lighting systems. The inventory found that 41 percent of the park’s lights are either full-cut-off fixtures or fully shielded, and therefore help protect night skies. The park aims for the 66 percent required by the International Dark-Sky Association to achieve “International Dark Sky Park” designation. That led to an FOA-funded project to replace light fixtures at Seawall and Blackwoods campgrounds. If you are considering installing outdoor lighting on your property or business, learn about night sky friendly lighting at http://www.darksky.org.